Lewis Hamilton will return refreshed and ready to close in on his fifth world title this weekend when Formula One resumes after the summer break at the Belgian Grand Prix. After three weeks of inactivity, punctuated by retirement and transfer announcements, the defending four-time champion and his Mercedes team will relish a chance to extend their three-race winning run at the majestic Spa-Francorchamps circuit set in the Ardennes forests. Hamilton, who is 24 points clear of Ferrari's four-time champion Sebastian Vettel with nine races remaining, has won two of the last three Belgian races and is seeking his fourth overall. "The second half of the season, after the summer break, is usually better for us," said Hamilton. "It is always exciting, always intense and particularly so when we go to the long-haul races. It usually gets better for us." Hamilton will expect a very tough battle with Vettel, however, as Ferrari bid to bounce back for the championship run-in starting with back-to-back weekend races in Belgium and then on home soil at Monza in Italy. His Mercedes team chief Toto Wolff has been busy damping down any signs of over-optimism and warned that the final months are likely to remain as hotly-contested as the earlier part of the season. "The competitive balance swings back and forth from circuit to circuit," he said. "What is clear is that our competitors are pushing extremely hard and put up a very tough fight. There are no clear favorites at specific tracks anymore and it's not always the fastest car that wins." Hamilton's healthy position at the head of the title race owes as much to fickle weather conditions and some good fortune — or bad luck for rivals — as it does to his mesmerizing talent in wet conditions. He will be fully prepared for a wet-and-dry contest this weekend at a track where it can be raining in one corner and bathed in sunshine in another. 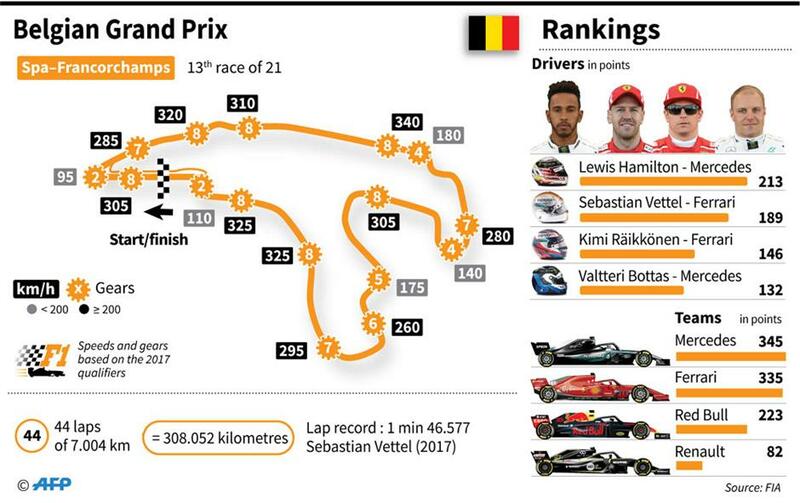 Hamilton would be wise too to be ready for a challenge from Ferrari's Kimi Raikkonen, who is something of a Spa specialist and is within reach of his 100th podium finish after taking a top three spot in all of his last five outings. The 38-year-old has won four times at Spa including claiming Ferrari's last victory in 2009. But he is without a win in 106 races since the 2013 Australian Grand Prix. A Belgian triumph would be a timely boost for his hopes of retaining his seat at Ferrari next year when it has been widely suggested that Monegasque protege Charles Leclerc, of Sauber, will step up and replace him. After making his decision to leave Red Bull for Renault next year, Daniel Ricciardo could also be a strong challenger along with Max Verstappen, his Dutch Red Bull team-mate. Ricciardo is to be replaced at Red Bull by Pierre Gasly, of sister team Toro Rosso. Fernando Alonso‚ announcement that he intends to leave McLaren and F1 at the end of the year was also unexpected — he will be replaced by fellow-Spaniard Carlos Sainz, of Renault — and sets him up for a brief ‘farewell tour' in which he would also be a popular winner.